Aug 19, 1901: Real Estate Transfer: N. C. Foster Lumber Co. to Swan Haglund, nw 1/4 sec 14 27 2w, $2,400. S.G. Haglund died at his home in the town of Warner Sept. 15, 1907, after an illness of a few months. His death was caused by tubercular peritonitis, to relieve which he underwent an operation at St. Joseph's Hospital, Marshfield, recently. Mr. Haglund went to California last spring hoping the change of climate would benefit him. He was pleased with California and returned to dispose of his property here. He failed rapidly after his return and died a few months afterward. Mr. Haglund was born in Sweden, Sept. 8, 1855, being 52 years and a week old when he died. He was married in the later 70's to Miss Gudmondson. Twelve children were born to them, two of them dying before they left Sweden and a baby (Karl Russel b. 3-18-1903, d. 5-15-1903) here about four years ago. Of the nine living, two are in the West, Hugo (Greenwood cemetery: Hugo Vincent b. 1880, d. 8-24-1936), at Carrington, N.D., and Edvald (1905 census = Oswald, later = Ed) at Havre, Mont. ; Mrs. Alex (Agnes) Behrens, the oldest daughter, lives south of town. Four boys and two girls live at home with their mother. All were present at the funeral except the two boys in the West. The family came to America in April 1889, locating in Chicago, where Mr. Haglund worked at the tailor trade. After living in Chicago about twelve years they came to Greenwood. Mr. Haglund bought the Bilshowsky property and conducted a general store business for a time and then moved his family to a farm in the town of Warner, where they have lived since. During this latter time Mr. Haglund worked at his trade in Chicago. The funeral was held from the home in Warner. The remains were laid to rest in the Greenwood Cemetery. Members of the local lodge of Beavers, of which deceased was a member, were present in a body at the burial services. Mrs. Charlotte Haglund, 83, pioneer resident here died at the Neillsville Hospital this morning, Apr. 2, 1942 of old age complications. She had been in failing health all winter. Funeral services were held in the Stabnow Funeral Home and in the United Lutheran Church. Burial was made in the Greenwood Cemetery. Mrs. Haglund was born in Sweden on Sept. 20, 1858 and came to this country with her husband, Gustave, and family about 49 years ago. Her husband died 34 years ago. Surviving are four sons, Gust, Havre, Mont. ; Ed, Lewistown, N.D.; Arthur, Bismarck, N.D.; Elmer, St. Paul, Minn.; Mrs. Leon (Tinsina) Clute, Havre, Mont. ; Mrs. Ted (Hilda) Johnson, St. Paul, Minn. and Mrs. Agnes Behrens, Greenwood. Mrs. Agnes Behrens, 73, died of a heart attack June 23, 1954, at the home of her son-in-law and daughter, Mr. and Mrs. James Redgren, at Menomonie. She had been in ill health the past several years. Funeral services were conducted at Our Savior's Lutheran Church. Burial took place in the Greenwood Cemetery. Mrs. Behrens, nee Haglund, was born March 31, 1871, in Sweden. At the age of eight years, she came to America and settled in Chicago with her parents. Later the family came to Greenwood and lived on a farm southwest of here. On Dec. 31, 1903, she was married here to Alec Behrens. After their marriage, they resided on a farm south of here, then moved to a farm northeast of here. Mr. Behrens died in Aug. 1941, and in 1942, she moved to the city. Mrs. Behrens was a member of Our Savior's Lutheran Church and its Good Hope Ladies Aid Society the local Order of the Eastern Star, Greenwood Women s Club and a charter member of the Hemlock Community Aid. She is survived by five sons: Edwin Behrens, Owen; Louis Behrens, Greenwood; Karl Behrens, Franklin Park, Ill.; Harry Behrens, Miami, Fla. and William Behrens, Torrance, Calif. Seven daughters: Mrs. Adolph (Adeline) Jackson, Owen; Mrs. A.J. (Irma) Hertzog, New Orleans, La. ; Mrs. Harold (Lucille) Schmidt, Suring; Mrs. James (Lillian) Redgren, Menomonie; Mrs. Churchill (Mildred) Eisenhart, Kensington, Md. ; Mrs. Rex (Eileen) Battenberg, Chicago and Mrs. Harold (Edith) Warner, Chetek. A sister Mrs. Tensina Heisler, Seattle, Wash and three brothers, Gust Haglund, Hardy, Mont. ; Arthur Haglund, Denmark, S.D. and Elmer Haglund, St. Paul. A son, Lee, six brothers (Ed, Bernard, Hugo, Karl Russell, plus two in Sweden) and a sister (Hilda) preceded her in death. Feb 15, 1906: Mrs. Alex Behrens, who has been visiting her mother, Mrs. Haglund, since Christmas, has gone to Greenwood to stay with Mrs. Borseth awhile. Mr. Elmer Haglund and Miss Bertha Zimmerman were united at the Lutheran Parsonage Oct. 1st, 1920. The groom is the son of Mrs. Haglund, while his bride is the daughter of Mr. and Mrs. Albert Zimmerman Sr. on route one. They left the same day for Minneapolis, where the groom is employed, to make their future home. Oct 4, 1934: The following prizes were awarded at the R.N.A. card party at Allards hall Monday evening: 500 -- Mrs. Ed Hinker, Mrs. Jos. Schmitz, Mrs. W. C. Steiger; Bridge -- Mrs. L. Cox, Mrs. Palmer Vinger, Mrs. G. I. Mullendore; Schafskopf -- Henry Stabnow, Mrs. A. H. Noetzel, Mrs. Irvine Gates; Skat -- Marcellus Hinker, John Lindner, Hugo Haglund. January 1936: The Moonlight Gardens dance hall, Greenwood, burned to the ground in an early morning blaze on Saturday. The fire threatened danger to the entire city for a time when a high wind carried burning embers out over the town. The fire, of unknown origin, was discovered shortly after 2 a.m. by Gilbert Rhode, a farm youth, who had attended a dance at the hall that evening and was driving through Greenwood after having taken a companion home. He notified the fire department. Firemen were unable to check the rapid spread of the flames but succeeded in saving the home of Mrs. Charlotte Haglund, next to the flaming building. Snow on the roofs of the nearby buildings was credited with preventing the fire from spreading farther. The Moonlight Gardens hall, formerly known as the Bagley hall, was built in 1892. The present owner, Charles Stout, estimated the los at $25,000, which is partly covered by insurance. Included in the loss were the set of drums owned by James Neuenfeldt, who had left them in the hall after the dance. "E.C. Hamplin" between the Goodwin and Rand families on the 1895 census, think "b" was mistaken and writen as "p". No Hamplin families found in CC. Also see William Goodwin, Warner township bio. Mrs. Jane Hamblin died at the home of her son, Wm. Goodwin, March 15, after a few days illness, having nearly reached the age of 78 years. She was stricken with paralysis the Friday before her death from which she did not recover. Jane Chambers was born in Ohio June 10, 1843, and when very young came with her parents to Milwaukee, where she lived until 12 years old, then moving to Elroy, Juneau Co., where she grew up. In 1860 she was married to Royal Goodwin, who later was in the Civil War. In 1876 she was married to E. Hamblin, who died twenty years ago. For 17 years she lived in Black River Falls and for the last years has made her home with her son William in this village (Loyal, Clark Co, Wis.). The funeral services were held at the M. E. Church. Interment was in the Greenwood Cemetery. CC marriages: 24 Oct 1886 Lydia Hamblin married Bryan Markam. Per the 1905 census, neighbors of the Louis Hanson family lived in what was known as the "West Side", Warner township sections 19-21; 27-34 west of the Black River. No information found on the Louis and Alma Hanson family, also checked Hansen. Per the 1905 census, neighbors the Elmer Hanson family lived in the Braun Settlement area, west of the Black River in Warner sections 4-9. The Withee farm was located in sec 4 so maybe this family lived in one of the rental houses and worked for the Withee family. Miss Hazel Hansen, daughter of Mr. and Mrs. Elmer Hansen of Owen was united in marriage to Mr. Louis Larsen of Waupaca on Jan. 11, 1920 at the First Congregational Church of Eau Claire. The ceremony was witnessed by a brother of the groom and his wife, Mr. and Mrs. Robert Larsen of Eau Claire. The young couple will be at home after Feb 1st at Waupaca, Wis., where the groom is employed. Miss Ida Hanson, second oldest daughter of Mr. and Mrs. Elmer Hanson of Owen, and Mr. Oscar Larson of Abbotsford were united in marriage at the Lutheran Parsonage at Abbotsford, July the first. The bride is well known here and is one of Owen's popular young ladies. The groom, son of Mr. and Mrs. Louis Larson of Abbotsford. The happy couple left for Waupaca, Oshkosh and several other places where they will spend their honeymoon. They will make their home in this city after July 15. Married, at the residence of Mr. Willard Pounder, April 4, 1886, by G. C. Andrews, Mr. W.W. Harlow to Miss Louis Hocks, both of the town of Eaton, Clark Co.
Greenwood High School HIGH SCHOOL CLASS OF 1906: Matilda Elstrom (Mrs. C. W. Sorenson), Longwood, WI; Dimple Harlow (Mrs. A. Eidsmore), Harlowton, MT; Bessie Fradette (Mrs. M. Burch), Toulan, IL; Robert Zetsche (teacher), Hixton, WI; Joseph Klinke (merchant), Greenwood, WI; Frances Anderson (lives on claim), Conrad, MT. George Harlow died June 19, 1931 at Medford, Wis., of pneumonia after being ill two weeks. He was born Sept. 24, 1868 at Ontario, Canada and moved to Greenwood with his parents at the age of four years. He was married to Ida C. White in 1893, residing at Greenwood until 1907, when they moved to Taylor County, where he has since resided. To this union were born five children, Nina (Mrs. Ray Warner) of Ironwood, Mich. Philip, who preceded him in death June 21, 1912; Fern (Mrs. Ora Warner) of Rib Lake, Wis.; Elso (Mrs. Albert Schwartz) of Minneapolis, Minn.; Edna at home and an adopted son, Earl Kelly. Funeral services were held at the First Methodist Church at Medford Wis. Interment was at Evergreen Cemetery at that place. Out of town relatives and friends who attended the funeral were: Philip White, Mr. and Mrs. James White, Mr. and Mrs. Herb White, Mr and Mrs. James Colby, Mr. and Mrs. Gilbert Polton, Mr. and Mrs. Walter Swieso of Loyal; Mr. Emil Haupt, Mayme and Harold Haupt, Mr. and Mrs. Walter Hubble and Mr. and Mrs. Peter Johnson of Greenwood; Mr. and Mrs. Ed Vine and George Vine of Birchwood; Mr. and Mrs. Asa Warner, Mr. and Mrs. Ray Warner, Mr. and Mrs. Ed James of Jump River; Mr. and Mrs. Frank Keefer, Mr. and Mrs. Wm. Quinn, Mrs. E. Keefer, Mrs. W. A. Bingham, Mr. and Mrs. R. A. Burss, Mrs. John Collins, Mr. and Mrs. Roy Armstrong of Hannibal; Mr. and Mr. Harry Bull and Mrs. Tom Gulso and son of Maplehurst. EARL KELLEY, adopted son of George and Ida Harlow: Died at her home, April 22, 1912, Mrs. S. R. Kelley, at the age of thirty-nine years. Edith Elizabeth Voss was born Oct. 6, 1872, in Dane Co, Wisc, the fourth child of Mr. and Mrs. E. Voss, and of a family of five children. Her first six years were spent on the farm where she was born, afterwards moving with her people to Lodi, Wis. The family remained there until 1886 when a new home was made at Black River Falls. After completing her education she taught successfully in the public schools of Jackson and Clark counties, both before and after her marriage. On May 30th, 1892, she was married at Sparta, Wis., to S. R. Kelley, moving to Greenwood a short time afterward, living on two different farms northeast of this city. Nine years ago the family came to Greenwood where they have resided since. The untimely death of the deceased leaves nine children, Velma, Vivian, Harley, Verletta, Charles, Leonard, Floyd, Edith and Earl (b. 1911) and infant of two weeks. A husband, mother, Mrs. M. J. Winter of Black River Falls, two sisters, Mrs. Davidson of Ironton and Mrs. McWilliams of Schlerville, two brothers, Wm. E. of Westmore, Mont., and Sylvester Voss of Black River Falls two step sisters, Mrs. J. E. Dimmick of Black River Falls, and Mrs. D. O. Sweet of Dos Palos, Cal., one step brother, Dr. E. H. Winter of Augusta, Wis., to mourn her loss. Burial was made in Greenwood Cemetery. The widow Ida Harlow, daughter of Phillip White, next married George Fiddler per the following obit of her father. Philip S. White, 90-year-old pioneer resident of our community, died of heart trouble and pneumonia Feb. 20, at the home of his son, James White. Mr., White was born in Frankfort, Ontario, Canada, Nov. 22, 1848. He was married there to Miss Ellen McKensie Sept. 19, 1872. In 1878 Mr. and Mrs. White came to the United States, settling in Outagamie Co, where they lived until their coming to Clark Co in 1880. He purchased wild land in the Town of York and lived there for 14 years. In 1899 he obtained a larger tract of land near Loyal, which he worked until 1913. Moving to the village of Loyal at this time, Mr. White made his home here until the death of his wife in 1919, and had since lived with his sons, James and Herbert. Surviving are five daughters: Mrs. George (Ida) Fiddler, Lakeland, Fla., Mrs. Norman (Eunice) Rogers, Harlowton, Mont., Mrs. Hobert (Alice) Swieso, Loyal, Mrs. James (Mina) Colby, and Mrs., Walter (Effie) Swieso, Greenwood: and five sons: Will and Dave, Spokane, Wash., Frank, Chattaroy, Wash., and James and Herbert, Loyal. One daughter, Mrs. Emil (Mary) Haupt of Greenwood died 23 years ago. Two sisters, Mrs. Emma Phillips, Michigan, and Mrs. Catherine Walker, Alabama, also survive. Mrs. Walker who is 83 years old, returned to Alabama several weeks ago after a visit with her brother here. Funeral services were held in the Methodist Church. Interment was in the Loyal Cemetery. Nov 20, 1893 York: Mrs. George Harlow, of Greenwood, visited with friends at this place last week. Jan 25, 1906: A brand new little daughter (Elsalee) is reported as arriving at the home of Mr. and Mrs. Geo. Harlow, in the town of Beaver Tuesday morning (Jan 23). March 15, 1906: The little daughter (probably Fern) of Mr. and Mrs. Geo. Harlow who live in the town of Beaver got one cheek and arm quite badly burned and bruised early last week by pulling a hot flat iron off the board while her mother's back was turned. It is thought the wounds will not prove as serious as was at first supposed. 1907 Township Officers for Warner, Clark Co., Wisconsin. Constables: A. Johnson, B. F. Ketchpaw, S. J. Smith and Geo. Harlow. On last Friday afternoon at about 5 o'clock a runaway accident occurred near Loyal that resulted in the death of Phillip Harlow and injury to his grandfather Phillip White. They were returning home after doing a little trading in the village when they met an old friend of Mr. White, Hans Schmidt, who raised the stick he was carrying in greeting them. The team became frightened and unmanageable finally throwing the occupants out of the buggy. The younger one was run over across the temple killing him instantly and his grandfather was pitched forward back of the horses breaking his shoulder and injuring his back, Mr. White is almost prostrate with grief over the accident but is entirely blameless in the matter. (Grandfather Phillip White lived to be 90 years old, died in 1939) Phillip Francis Harlow was born May 7, 1898, and died June 21, 1912, at the age of 14 years, 1 month and 14 days. He was the oldest son of Mr. and Mrs. George Harlow, former residents of Greenwood, but now of Hannibal, Wis. Funeral services were held at the Presbyterian church. Burial was made in the Greenwood Cemetery. John Ole Heggesta was born June 2, 1867 at Blanchardville, Wisc. On Feb 17, 1894 he was united in marriage to Mrs. Ellen Eldsmos at Blanchardville. In 1904 they moved to Greenwood, but 11 years later sold their property and moved to Harlowton, Montana. In the fall of 1915 they returned to Greenwood and in 1917 they moved to Jackson Co. In 1930 they moved to Abbotsford where Mrs Heggesta died. Mr. Heggesta was a member of the Lutheran Church and acted as school clerk while in Jackson Co. Mr. Heggesta passed away June 1, 1938 at Madison, Wisc of a heart ailment, having reached the age of 70 years. He is survived by one son, Lawrence, two daughters, Mrs. Ed Jolivette of Abbotsford and Mrs. A. W. Erickson of Madison one brother, George of Blanchardville. Funeral services were conducted at Blanchardville with burial taking place there. Ellen Christine Engen was born March 4, 1861 in the Town of Primrose, Dane Co, Wis., where she grew to young womanhood. In 1882 she was united in marriage to Tosten Eidsmoe, who passed away in 1889. Two sons, Albert, who died in 1916 and Sever, who died in 1920 were born to them. On Feb. 17, 1894 she was united in marriage to John Heggesta at Monroe. Residing in the Town of Moscow, Blanchardville, until 1904 when they came to Greenwood, Clark Co and resided here for 13 years. Then they moved to a farm in the town of Garden Valley, Jackson Co. In Sept. 1931 they moved to Abbotsford, Clark Co, where they resided until the time of her death on Feb. 13, 1934. The remains were taken to Balanchardville, where the funeral services were held at the York Church, Burial in the York Cemetery. Besides her husband, she leaves to mourn her loss, one son, Lawrence of Hixton four daughters, Mrs. A.W. Erickson of Madison Mrs. Edwin Jolivette and Mrs. Oscar H. Nelson of Abbotsford one sister, Mrs. Henry Eidsmoe of Blanchardville. An infant daughter preceded her in death in 1899, also three brothers and two sisters. March 8, 1906: One of Henry Bredson's little boys was bitten last Wednesday by a dog belonging to John Heggesta and as a consequence the dog and several others in the neighborhood have been sent to the happy hunting grounds of dogdom. Hemlock, located twenty miles north of Neillsville (three and one-half miles north of Greenwood), in Warner Township (sec 15), is the location of the dam of the Black River Logging Company's dam, also of a grist and sawmill, the latter owned by Niran H. Withee. The dam was completed in 1879, at a cost of $21,000, and is one of the most complete works of improvement in the county. Of the other improvements, the gristmill was finished in 1879, and is supplied with three-run of stone. It is a frame, four stories high, and does a large local business. The sawmill is also of frame, two stories high, and is furnished with a rotary and upright saw. The total investment is between $10,000 and $15,000. The settlement is connected with Neillsville by telephone, erected in 1879 at a cost of $800. 1881 History The little village of Hemlock, on Black river, has two large mills, one flour mill and one lumber, shingle and lath mill. The waterpower, by which these mills are run, is unlimited here. There is a sufficient volume and fall to run any number of mills and factories. Hemlock is the northern terminus of the telephone line that extends south to La Crosse, and east to the towns on the Wisconsin Central line. It is the longest telephone line in this section of the country. 1890 History Hemlock hamlet consisted of a boardinghouse, a store and eight houses, including that of the Withee family. This hamlet bore the name of Hemlock, a name which was adapted from a stand of hemlock trees in the area, and which has continued in the name of a cheese factory located a mile or two to the east. The great flood of 1914 tore out the dam and left hardly a trace of the sawmill, or the gristmill. The end of the mills meant the end of industry at Hemlock. Theodore Withee was then involved. He had not the resources with which to tackle the restoration of the mills. The wind also struck, tearing down the cow barn and the Warner town hall, across the lane from the eastside of the Withee lawn. The townhall had been located in the old lush days, when Hemlock promised to become a real village. It had been a lively place, with preaching, dancing and Sunday school, in addition to the infrequent town meetings. Mrs. Marie Hendrickson, daughter of Ole and Ingeborg Peterson, was born at Tronhjem, Norway, July 19, 1867. She came to Greenwood in 1873 at the age of 6 years. She was united in marriage to Alexander Hendrickson on Oct. 24, 1884 and has resided on her farm in the Town of Warner since that date, and passed away there July 16, 1939. She is survived by three sons, Oliver (Henderson), Carl (Turnquist) and Arthur (Turnquist), two daughters, Mrs. Myrtle Anderson and Mrs. Ervin (Annie) Elmer, a sister, Mrs. Olive Hembre. Two brothers preceded her in death, Oliver, who died in infancy and Carl who died in 1931. Funeral services were conducted at the home and at the Trondhjem Lutheran Church. Burial was made in the Greenwood Cemetery. The pallbearers were Will Rossow, Olaf Johnson, John Johnson, David Danielson, Andrew Olson, Adolph (brother of John) Turnquist. Note that the obit for Oliver Hendrickson lists Carl and Arthur Turnquist as half-brothers. Oliver's mother was Marie nee Peterson Hendrickson, listed as a widow on the 1905 census. Marie is buried as "Hendrickson" and no record was found of a marriage between Marie Peterson Hendrickson and John Turnquist who was listed as a widower on the same 1905 census. No further info was found on Alexander, brother of Victor Hendrickson. 1947 Obit of Clinton Hembre: "...Six cousins, Carl and Arthur Turnquist, Olaf, Hoken and Ralph Ystad, and Arthur Hendrickson served as pallbearers..."
Oliver J. Hendrickson, 70, lifetime resident of the Greenwood, area, died Oct. 3, 1956 at St. Joseph's Hospital, Marshfield, where he was admitted earlier that day after becoming ill suddenly at his home. He had been suffering from an asthmatic condition. Funeral services were held at Our Savior's Lutheran Church. Burial was in the Greenwood Cemetery. Mr. Hendrickson was born (parents Alexander and Marie Peterson Hendrickson) in the Town of Warner Dec. 23, 1885 and married Amy Pearson June 22, 1911 in the Town of Beaver. They farmed four miles northeast of there until three years ago when they retired and moved to Greenwood. Besides his wife (Amy 30 July 1892 - 26 Mar 1986), survivors are three children, Mrs. Donald (Doris) Dusso, Fox Lake; Arthur (Arthur A. 4 Dec 1914 - 22 Mar 1990, m. Mayvin Poppe 5-22-1943) and Harold, Greenwood and (sister) Mrs. Myrtle Anderson, Cadott two half-brothers, Carl and Arthur Turnquist, Greenwood. Two infant sons preceded him in death. Harold Hendrickson, 69, Greenwood, died Aug. 8, 1990, at Neillsville Memorial Home. Funeral services were held at Our Savior's Lutheran Church, Greenwood. Burial was in the Greenwood Cemetery. Full military rites were held by the Greenwood American Legion. Harold Hendrickson was born Oct. 6, 1920, (cemetery has born in 1922) in Greenwood, to Oliver and Amy (nee Pearson) Hendrickson. He received his education at Christopherson School. He served in the U.S. Army in World War II, from 1942-1945. He married Melva White April 19, 1947 in Loyal. He farmed in the town of Warner until 1971, when they moved to Greenwood. He had worked for 25 years at Roth Manufacturing, Loyal and Artcraft in Spencer. He was a member of the Greenwood Legion and Our Savior's Lutheran Church. Survivors include his wife and three daughters, Barbara Bowe, New Berlin; Mrs. Dennis (Charlotte) Colby, Greenwood and Tracy Hendrickson, Greenwood; one son, Dan Hendrickson, New Richmond and one sister, Mrs. Doris Dusso. Married, at the residence of the groom, Aug. 13, 1883, by Rev. G. C. Andrews, Mr. Victor Hendrickson to Miss Ingebor Anderson, both of the Town of Warner, Clark Co. The following was given us for publication. Mrs. Hendrickson was the wife of a former Greenwood boy, Alfred Hendrickson, who is well known here. Mrs. Alfred Hendrickson, after a long season of sickness covering a year or more, died in the White hospital in Lewiston Monday. The funeral was held in Asotin in the Merchant Undertaking Chapel, and the remains were placed at rest in the Asotin Cemetery. Mrs. Hendrickson, whose maiden name was Ruby May Appleford, was born in Craige, Wash. on April 13th, 1890 and would have been thirty years of age, had she lived on a few days longer. She was united in marriage to Alfred Hendrickson on July 11, 1914, and has since lived with her husband on their farm near Anatone, until one year ago when she contracted the influenza, from which she never entirely recovered, but developed into tuberculosis and other complications. During the past year she has submitted to several operations hoping to regain her health, but all were to no avail, and her condition became continually worse until passing away on March 28, 1921. Beside her husband, Mrs. Hendrickson leaves two little sons, Elvin, aged five and LeRoy, aged three, a mother, Mrs. Wm. Appleford, four sisters and five brothers. Mrs. Adolph Turnquist, 84, a lifelong resident of Greenwood, died Sept. 18, 1965, at the Memorial Hospital in Neillsville, where she had been a patient since Aug. 31. Funeral services were conducted at Our Savior's Lutheran Church, and burial will be made in the Greenwood Cemetery. 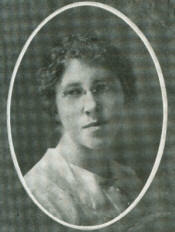 The former Julia Hendrickson was born (parents Victor and Annie Hendrickson) Feb. 19, 1881, in the town of Warner. Her marriage to Adolph Turnquist, who preceded her in death July 28, 1950 (1960 per his obit), took place June 3, 1903, at Greenwood. After their marriage, they resided in the city of Greenwood for three years, and then moved to a farm south of Greenwood. In 1921, they moved to a farm northeast of Greenwood, where she had resided since. Mrs. Turnquist was a member of Our Savior's Lutheran Church and the American Lutheran Church Women. Survivors include four daughters, Mrs. E. H. (Helen) Axelson, Chicago; Mrs. Paul (Vera b. 15 Aug 1913, d. 18 Aug 2006) Tell, Palatine, Ill.; Mrs. Jerome (Ruth b. 2 Mar 1917, d. 28 Nov 1997) Bertz, Loyal and Mrs. John (Verdelle) Felix, Greenwood. (Adolph and Julia's child Adrian Turnquist d. 14 July 1904, no birth date) Four brothers, John Hendrickson, Clarkston, Wash.; Oxil Hendrickson, Osotin, Wash.; Donald Hendrickson, Lewiston, Idaho and Roy Hendrickson, state of California. Seven sisters, Mrs. Marie Wilcox, Cadott; Mrs. Sophia Davis, Boise, Idaho; Mrs. Viola Weisberger, Walla Walla, Wash.; Mrs. Fred (Ruth) Beier, Denver, Colo.; Mrs. Helen Campbell, Clarkston, Wash.; Mrs. Archie (Esther) Smith, Connell, Wash. and Miss Agnes Hendrickson, Lewiston, Idaho. She was preceded in death by a son, two brothers, and three sisters. Adolph Turnquist, 88, died July 28, 1960 at his home in rural Greenwood after a lingering illness. Funeral services at Our Savior's Lutheran Church, and burial in the Greenwood Cemetery. Mr. Turnquist was born June 13, 1872, in Torboda, Sweden. He came to this country in 1892 and settled in Chicago, Ill. Two years later he moved to Greenwood and after his marriage to Julia Hendrickson on June 3, 1903, he began farming in this area. He operated his farm 3 miles northeast of Greenwood for the past 48 years. The Turnquists celebrated their golden wedding anniversary in 1953. He served on the Christopherson School Board for many years and was a member of Our Savior's Lutheran Church. Surviving him are his widow and four daughters, Mrs. E.H. (Helen) Axelson, Chicago, Ill. Mrs. Paul (Vera) Tell, Palatine, Ill. Mrs. Jerome (Ruth) Bertz, Loyal and Mrs. John (Verdelle) Felix, Greenwood. July 1880: The Fourth of July, being on Sunday, was celebrated on the Fifth in Greenwood. The Americans, Germans and Norwegians, all having separate entertainments, each celebrated the day according to their own customs, as they have done in former days under their own fig trees. The evening brought a very large party together at the old Robinson hall. A grand time was had by all. The supper, gotten up by Henshall and his wife, was complete in all its expectation. All was full of life until daylight, when each one sought a place in which to catch a few hours of slumber. In an incredible short time the streets were as still as the yonder grave yard. The large flag strung across the street has been taken down for future use. However, the two flags, four feet by six feet, upon Brown's and Eaton's stores are to float on undisturbed. They shall remain until the glad news of Gen. Garfield's election to the presidency shall be heralded from the Atlantic shores to the Pacific slopes. Jan 1881: Ole Melby, a Norwegian in T. J. LaFlesh's logging camp, had a two-inch square of his skull broken in by a falling tree. He was taken to Greenwood's Henshall's Hotel and Dr. Thomas was summoned. Melby's life was in danger, but with the skillful treatment of Dr. Thomas, he is reported as doing well and expected to fuller recover. April 17, 1884: Geo. Henshall is remodeling his house and when it is completed he will serve up meals to the weary traveler in first-class style. July 3, 1884: Geo. Henshall will have a bower completed by the 4th when the merry dancers can enjoy dancing in the pure, fresh air. Died, in this village (Thorp), on the 4th of Nov. 1884, Mark, son of George and Mary T. Henshall, aged eight years. The remains were taken to Greenwood for interment. Greenwood cemetery also contains the graves of Birdene "Birdie" Henshaw, b. 7 May 1868, d. 23 July 1876, daughter of George H. Henshaw. Birth records have an Arthur E. Henshaw b. 13 Feb 1898. No further info on "Henshaw". Think these two "Henshaw' might belong to the Henshall family. No census records found for Henshall or Henshaw. No "Heuck" or "Hueck" found in CC records. Also tried "Huyck" but no "P" and the Huyck family who lived in the Humbird area. Rev. Carlos Hoffner of St. Mary's church in Sterling? March 1931: Chas. Hogue, one of the few Civil War veterans living in Clark Co, passed away at his home in Greenwood last week. He was buried with military honors, the American Legion having charge of the ceremonies. Charles Patterson Hogue was born February 26, 1844. He enlisted with the unassigned 3rd Regiment of the Wisconsin Infantry on October 10, 1861 serving as a Corporal and was discharged July 18, 1865. He died February 24, 1931 and is buried in the Greenwood City Cemetery. His son, W. E. Hogue of Greenwood was listed as his next of kin on his grave registration. Sunday Mr. and Mrs. Harry Hogue, of Greenwood, celebrated their golden wedding anniversary, which took place Monday, April 8, 1946, at their home... Mrs. Hogue, nee Margaret Fahey, daughter of Bridget and Jack Fahey, and Harry Hogue, son of Mathilda and Charles Hogue, repeated their marriage vows at Marshfield, April 8, 1896, eight years after Miss Fahey came to Greenwood from Canada with her mother, brothers and sisters. After their marriage the couple operated a restaurant in Greenwood for seven years. Mr. Hogue is a carpenter by trade. Three children were born to this union: Mrs. Ralph (Eva) Weidman of Withee, who died June 14, 1945; Mrs. Arthur Zahren, Chicago, who died May 2, 1945; and Mrs. Al (Adine) Penrose, Coloma, Mich. One grandson, Robert Zahren, is now serving in the Pacific Theater of Operations..."
An 86-year-old Greenwood resident, Harry E. Hogue, died at the Havernet Nursing Home at Owen, where he had been a patient the past two months. Funeral services were held at St. Mary's Catholic Church. Burial took place in the parish cemetery. Born Feb. 21, 1869 in Sparta, Mr. Hogue came to Greenwood as a young child with his parents. He worked in the woods for some time and later as a carpenter. His marriage to Maggie Fahey took place here April 6, 1896. The couple celebrated their golden wedding nine years ago. Mr. Hogue is survived by his wife (Margaret nee Fahey Hogue 3 Oct 1870 - 6 Jan 1959), a daughter, Mrs. Al (Adine) Penrose, Coloma, Mich.; a brother, Oscar Fahey (s/b Hogue), Portland, Ore.; five sisters, Mrs. John (Nellie) Buhite, Mrs. Ethel Trip and Miss Della Mae Fahey, all of Portland, Ore., Mrs. Owen (Stella) O'Connor, Rathdrum, Idaho, and Mrs. Carl Simarson, Chicago. Two daughters and two brothers preceded him in death. William E. Hogue, 75, died Apr. 12, 1949 at his home at Greenwood, after a 6 year illness following a stroke. Funeral rites were conducted by the Methodist Church at the Stabnow Funeral Home. Interment will take place at Greenwood. Mr. Hogue, son of the late Charles and Mathilda Hogue, was born in Greenwood Feb. 17, 1874, and was married there July 3, 1899, to Ingebor Peterson. He spent his early years in the woods and lumber camps and later served as a marshal for the City of Greenwood for 20 years. He resigned that position to go into dairy farming and to operate a milk route. In 1942 he resigned when he became ill. Surviving besides his widow are two sons, Bernard, Cudahy, and Clarence, Merrillan; three granddaughters, Kathleen, Carol, and Sharon Hogue, Cudahy; two brothers, Harry, Greenwood, and Oscar, Portland, Ore., and five sisters, Mrs. Owen (Stella) O'Connor, Rathdrum, Idaho; Mrs. Nellie Buhite, Mrs. Ethel Tripp, and Miss Della Mae Hogue, all of Portland, Ore. and Mrs. Pearl Simerson, Chicago. Another brother, Ray of Idaho, preceded him in death. Funeral services were held at at the Grace United Methodist Church for a former resident of Greenwood, Mrs. Ingebor E. Hogue, 92, of Walnut Creek, Calif., who died at a hospital there April 8, 1969, after suffering a stroke a few days before. Burial was made in the Greenwood Cemetery. The former Ingebor Peterson was born (dau of Elias Peterson) May 13, 1876 in Greenwood and was married there July 3, 1899 to William E. Hogue, who preceded her in death April 12, 1949. The couple operated the dairy that is now owned by Mr. and Mrs. Hugh Severson. Mrs. Hogue lived in Greenwood most of her life until the death of her husband, when she went to live at Cudahy with a son, Bernard, and family. In December of 1965 she moved with the family to Walnut Creek, Calif., and had lived there since. Survivors include two sons, Bernard (18 Dec 1899 - 22 July 1975, m. 15 Feb 1923 to Louise Kaiser, dau of Adam and Rose Kaiser), Walnut Creek, Calif., and Clarence (10 Aug 1902 - 5 Sept 1973, m. 23 Nov 1927 to Helen C. Ehlers, dau of Joh and Mary Ehlers), Marion, Wis. In addition to her husband she was preceded in death by a brother and a sister. April 3, 1905 Hemlock: School began Wednesday morning with Miss Estella Hogue as teacher. Oscar, son of Charles P. and Matilda nee Potter Hogue, married Minne Pratt on 9 May 1893. Oscar was living in Portland, OR per mother's 1930 obit; Medford (OR?) per brother Ray's 1936 obit; Portland, OR per brother William's 1949 obit and brother Harry's 1955 obit. Minne nee Pratt Hogue next married Mike Kobaskie (1880-1926) on 19 Sept 1919. (Oscar and Minne apparently were divorced.) Two of Oscar and Minne nee Pratt Hogue's children were Oda Faye and Unita B. Hogue. Oda Faye Hogue was born (to Oscar and Minne nee Pratt Hogue) in Greenwood, July 2, 1899, and died in the hospital at Marshfield, January 27, 1915. She was taken to the hospital January 21, suffering with what seemed to be blood poison in her face. The disease did not prove to be blood poison, and during the six days that she was in the hospital, was a puzzle to both doctors and nurses. The funeral was held from the Methodist church. The freshman class of the High School of which she was member, attended in a body, and the large flag at the school was kept at half-mast during the service. She is survived by her four grandparents, her parents, two sisters, two brothers.